A two-day summit about the Lake Michigan Water Trail, a 1600 mile paddling route around the lake, will be held in Saugatuck Nov. 8 and 9. at the Saugatuck Center for the Arts. The event is open to the public and organizers say they hope to draw paddlers, cyclists hikers, convention and visitors bureaus and urban planners. The event will focus on the development of a “multi-modal” route around the lake that includes US Bicycle Route 35, paddling and hiking routes as well as motor routes in Michigan, Illinois Indiana and Wisconsin..
“Some of this will be for developing the policy side, but the other major focus is how to market a Lake Michigan leisure corridor to the world, the region and to the people around the lake,” said Dave Lemberg, the conference coordinator and an associate professor at Western Michigan University’s Department of Geography. 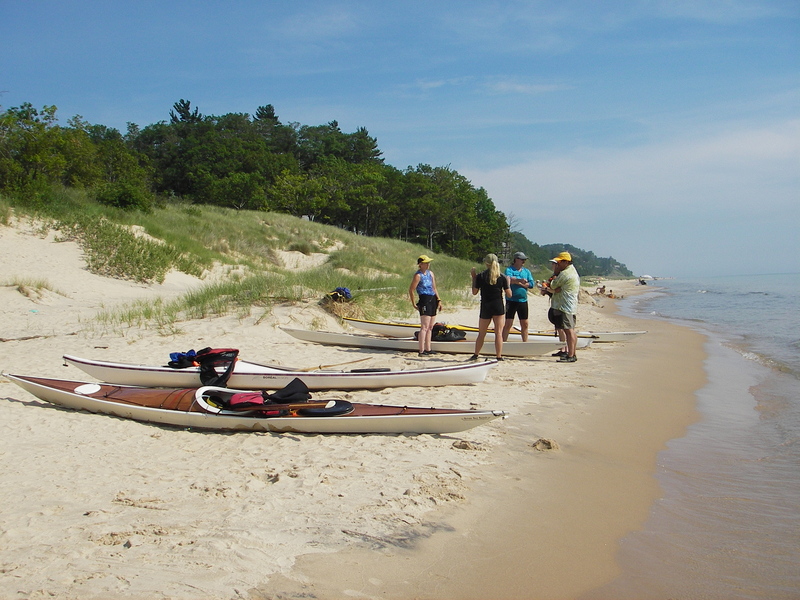 Lemberg is the Michigan coordinator for the Lake Michigan water trail, a four state paddle route established by the Obama administration in 2009 as a National Recreation Trail. Lemberg recently finished up an inventory of Michigan shoreline access sites. Indiana and Wisconsin have completed theirs. The access sites are places where people can launch or take-out, places to stop rest and resupply. The longest gap is a 25-mile segment on the Garden Peninsula in Michigan’s U.P., according to Lemberg. The longest Lower Peninsula gap is 15-miles in Emmet County between Harbor Springs and Redmond Township beach, but there are public properties for resting in between. This entry was posted in Uncategorized and tagged Cycling, Hiking, Kayaking, Lake Michigan Water Trail, National Recreation Trail, Paddling, Saugatuck. Bookmark the permalink. This two-day summit is starting out well with a beautiful vision for the future. Dave Lemberg is smart to start right off working with both policy and marketing input. I expect some Pure Michigan tourism staffers will be present to help move this project forward.